The first edition of the Tehran International Contemporary Music Festival was held last April at Roudaki Hall (Vahdat Hall), Tehran Museum of Contemporary Art and Iranian Artists’ Forum. The festival, an independent cultural and artistic endeavor that is planned to be held annually, included lectures about contemporary music and art in general, different stage performances and experimental improvised presentations by more than thirty ensembles. A wide spectrum of national musicians like Mehdi Behboudi, Mohammadreza Govahi, Sina Shoaei, Siavash Sojoudi, Kian Hosseini, groups like “Arvand”, “A4” and “Trans-Modern” string quartets, “O.R.P. Quartet” and “Anil Guitar Quartet”, along flute recitals by Firouzeh Navaei and Ali Choupani, violin by Arash Asadnejad, guitar by Farzin Tehranian, double bass by Farshid Patinian and more performed at the week-long event. The festival welcomed also many artists from abroad, including Geert Callaert (Piano) and Bert Helsen (Bassoon) from Belgium, the Stockholm Saxophone Quartet, Opia Ensemble with Aleksandra Pykacz (Cello) from Poland and Ioana Mandrescu (Piano) from Romania, Reso Kiknadze from Georgia (Saxophone and Free Improvisation), Lugano Ensemble from Switzerland and Martyna Kosecka (Piano and Electronics) from Poland. This entry was posted in music and arts and tagged Belgium, Georgia, Music, Poland, Polska, Romania, Schweiz, Sweden, Switzerland, Tehran Contemporary Music Festival on May 15, 2016 by socialinform. The 2015 Zurich Film Festival (September 24- October 4) is hosting Iranian films in the New World View section of the festival. Every Year, in the out-of-competition section, the Festival has dedicated the New World Section to films from a foreign country. In the past years, films from India (2014), Brazil (2013), Sweden (2012) and Turkey (2011) have been selected for this section. This year ZFF is hosting films from Iran. A total of 11 films from Iran will be screened: “13” by Houman Seyyedi, “Fish and Cat” by Shahram Mokri, “Atomic Heart” by Ali Ahmadzadeh, “Bright Day” by Hossein Shahabi, “I am not Angry” by Reza Darmishian, “Nahid” by Ayda Panahandeh, “Profession Documentarist” by Shirin Barghnavard, “Paradise” by Sina Ataian, “Acid Rain” by Behtash Sanaiha, “What’s the Time in Your World” by Safi Yazdanian and “Wednesday May 9” by Vahid Jalilvand. This entry was posted in Cinema and tagged Cinema, Film, Iran, Schweiz, Switzerland, Zurich on September 28, 2015 by socialinform. Iranian skier Seyyed Morteza Jafari made history at the Grass Skiing World Cup in Dizin, collecting the Iran’s first gold medal in the sport. After winning a silver medal in Super G, he finished in the first place in the giant slalom competitions with a time of 51:09 seconds, followed by Italian Eduardo Frau with 51:78 and Austrian Michael Stocker with 51:98. Slovakian Barbara Mikova won gold medals in Ladies’ Giant Slalom and Ladies’ Super G.
The tournament, that brought together skiers from Austria, the Czech Republic, Italy, Slovakia, Switzerland and Iran, was organized in Dizin. It is the third time, that this ski resort located in the Alborz mountain range and near the capital Tehran, hosts a Grass Skiing World Cup event. The World Cup season 2015 got underway on July with giant slalom and slalom competitions in Predklasteri (Czech Republic) before moving to Ravascletto (Italy) for slalom events on 17th and 18th July. The tour stopped in Dizin (Iran) on 6th and 7th August, and Marbachegg (Switzerland) on 15th and 16th August, both for giant slalom and super-G events. The World Cup Finals will be held from 21st-23rd September in Kaprun (Austria). The two major highlights of the season will be the Junior World Championships in Stitna (Czech Republic) from 28th July-2nd August and the World Championships in Tambre (Italy) from 1st-6th September. This entry was posted in Sports and tagged Alborz Province, Austria, Österreich, Czech Republic, Dizin, Grass Skiing, International, Iran, Italia, Italy, Photos, Schweiz, sports, Switzerland, Tehran Province, Youth on August 25, 2015 by socialinform. The Mehr Theatre Group, an Iranian troupe led by director/writer Amir-Reza Kuhestani, will be performing the play Hearing in Switzerland, the Netherlands, Germany and France. The show centers on events happening in a girls’ dormitory. Hearing premiered at Tehran’s City Theater in July before going on stage in Zurich, Switzerland at the Zürcher Theater Spektakel. They are attending the Noorderzon Festival in Groningen, the Netherlands with performances on August 25th and August 26th. The girls’ dormitory was always like an unattainable castle. […] After the entrance door, a female world begun in which the entree of any man was prohibited. […] Now, presume that in a situation like this, one day, a girl reported that she had heard a man in one of the rooms. This would be the starting point of the performance. This entry was posted in music and arts, Personalities and tagged Amir Reza Koohestani, Art, France, Germany, International, Iran, Mehr Theater Group, Netherlands, Personalities, Switzerland, Theater on August 23, 2015 by socialinform. The exhibition took place at the Iranian Artists Forum in Tehran and displayed fresh look at the typography, posters and contemporary Swiss design. There were works by a number of Swiss graphic designers on display, including Flavia Cocchi, Nadine Kamber, Claude Kuhn, Felix Pfäffli, Melchior Imboden, Erich Brechbühl, K. Domenic Geissbühler, Megi Zumstein, Claudio Barandun, Jean-Benoit Levy and Roger Pfund. Iranian artists Ebrahim Haghighi, Ghobad Shiva, Amrollah Farhadi, Saeed Babavand and Ambassador of Switzerland to Iran Giulio Haas attended to the opening ceremony. This entry was posted in music and arts, People & Society and tagged Art, Graphic design, International, Iran, Photos, Switzerland, Tehran on May 19, 2015 by socialinform. A total of 10,266 computer programmers from 103 countries participated in the competitions hosted by Bayan knowledge-based company. After a qualification round held online during October 9-12, 2014 and an elimination round that took place online on October 19, sixty contestants from the top 20 countries advanced to the finals. A total of 4,910 contestants from 54 countries participated in the contest during 2012-13. Talented programmers compete in solving problems inspired by real-world scenarios. Contestants are free to choose their programming language, which is not limited because of the output-only nature of problems. All accommodation expenses are covered by the company, while the flight expenses of the top ten participants will be met by the organizers. Bayan is a privately held Information Technology and consulting company specializing in large-scale web applications. Bayan has developed many products and services since its establishment, including Blog.ir (hosted blog service), Hod.ir (web-mail service), BayanBox.ir (file hosting service), Sana (smart cloud storage system) and Salam.ir (meta search engine, focusing on retrieving relevant results for Persian search queries). This entry was posted in Uncategorized and tagged International, Iran, Russia, Schweiz, Switzerland, Youth on May 7, 2015 by socialinform. Teimour Ghaderi’s ‘It Hits upon the Roof’ has won the special award of Switzerland’s courtoujours short film festival. The short film It Hits upon the Roof competed with representatives from Russia, France, Tajikistan, Belgium, Portugal, Egypt, Mexico, and Switzerland and managed to scoop the jury’s special award and a cash prize of 1,500 francs. Produced by the Art Forum of Kurdistan province, Ghaderi’s narrative short movie depicts the life of a young boy who tries not to let his mother wake up by gathering the raindrops falling of their dripping ceiling into his hands. It Hits upon the Roof has been screened in several international film festivals so far such as 2014 Lucania Film Festival in Italy, Lahore Short Film Festival 2013 Celebrating Iranian Heritage, and the third MiCe Film Festival in Valencia, Spain. A house in a village, where only an old woman and a child live, the rain falls and starts dripping from the ceiling. The child tries to do something about the drips. 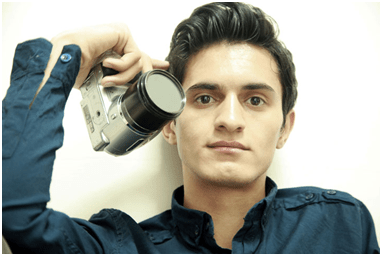 Teimour Ghaderi, born 1992, graduated in screen writing and photography. He has written the short stories: The Address I’m lost and Summer Cold. Has directed three short films: Pomegranate is the Fruit of Paradise, Picking the down and It Hit Upon the Roof. Winner of 18 national and international awards (Canada, South Korea, Czech Republic and Turkey) for the films Pomegranate is the Fruit of Paradise and Picking the Down. The international short-film festival of Geneva, CourToujours, is a platform, giving young film directors or confirmed talents the opportunity to present their short-films to a diverse audience. The 11th edition of CourToujours took place in the Swiss city of Geneva from the 19th to 21st February 2015 at Maison des Arts du Grütli. This entry was posted in Cinema and tagged Awards, Cinema, Film, Geneve, Genf, Iran, Schweiz, Switzerland on March 2, 2015 by socialinform.